When the letter ‘D’ is placed before certain words, it changes their meaning. The word ‘vision’, for example, which is one of the fruits of a healthy faith, becomes ‘Division’. In any business or relationship, there can only be one vision and one mind- set. If you and your partner have different visions, this will certainly result in problems, since a divided business cannot prosper. In marriage, if both spouses don’t have the same goals, if there’s no companionship, the ‘D’ virus enters, and if it is not removed quickly, it will lead to Divorce. Anything that is divided will not stand. In the passage above, the Holy Spirit reveals that Doubt (another ‘D’) in the Word of God creates a blockage that impedes us from receiving any answers from Him. One little doubt can paralyse the greatest faith in the world. Look at the photo on this page. 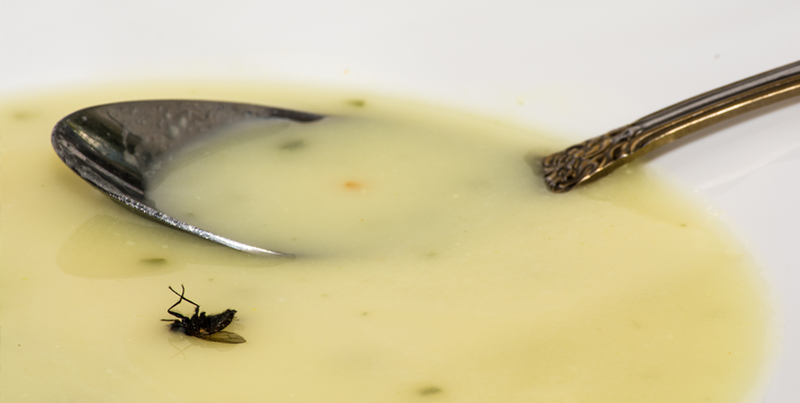 A small fly in a bowl of soup ruins the entire meal. Would you eat a spoonful of that soup? In the same way, one small doubt ruins all of a person’s faith, even when their faith is great. God will not accept faith that is contaminated by the ‘D’ virus of Doubt, even when that doubt is small. God requires you to be 100% certain about what you believe in. Just as faith brings life, doubt also brings death. While faith stimulates dreams and hopes, and increases a person’s self-esteem, doubt poisons dreams and hopes and leads to Depression. From a spiritual point of view, depression is nothing more than a permanent state of doubt. Medicine does not cure depression, but all who practise faith in the Word of God are free from it. Many look for strength and guidance in self-help books, philosophy, romance and various other things. They drink from the spirit of authors and teachers that they do not know (whose lives are, at times, worse than those of their followers) and the result is an increase of confusion and doubt. When you seek direction and strength from the Bible, meditate on it and pay close attention to every phrase—to Genesis and the origin of good and evil, or the books of Psalms, Proverbs, Isaiah, or the Gospels— you will notice a profound change in your inner self long before you nish reading the book. Why is that? Because the Spirit of the Word of God will touch you. Doubt is a persistent and highly contagious virus. How many times a day are you attacked by thoughts like ‘I’m alone because nobody likes me; ‘I’m unattractive’; ‘I’m too old to get married’; ‘I’m going to die alone’; ‘I can’t succeed’; ‘Trying is a waste of time’; ‘The best times of my life have come and gone’; ‘I might as well just end my life’; ‘I don’t deserve God’s help’; ‘There’s nothing I can do about my problems’; ‘What if I put my faith in God and nothing happens?’; ‘My faith is weak’; ‘I’m not like other people’; ‘I’m never going to be free’. When it’s not thoughts, it can be words from people you know or even from family members: ‘You’re taking this church business too seriously’; ‘You’re turning into a fanatic’; ‘I used to attend church like you until I realised it didn’t work’; ‘Haven’t you gotten married yet?’; ‘You still don’t have a job?’; ‘Are you okay? You look sick’; ‘That isn’t going to work’. In summary: the devil will do all he can to contaminate you with the poison of doubt. Keep up with the 7 Sundays to Boost your Spiritual Immune System study by coming to your local UCKG every Sunday at 10am (also at 7.30am). *If you want to receive the previous studies, you can ask your pastor.